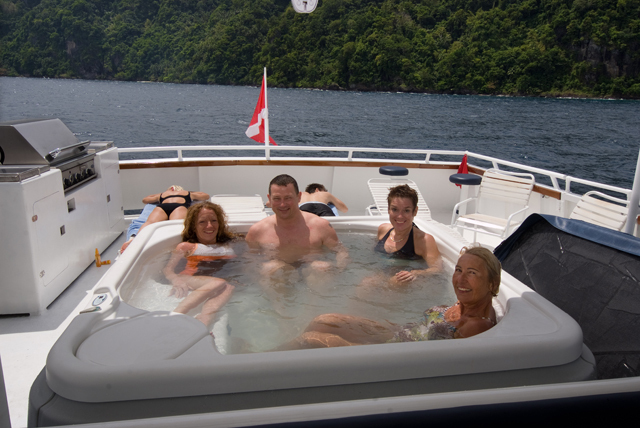 Why take another vacation in Florida when the Captain and crew of the liveaboard diveboat Atlantis Azores could welcome you aboard as you embark on your trip to one of four distinct scuba diving destinations in the Philippines. The best scuba diving equipment? 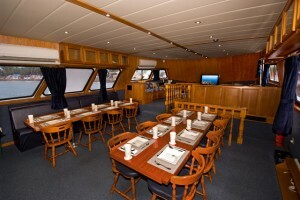 How about a liveaboard dive boat! This isn’t a cheap holiday deal, but you will enjoy some of the best diving in the world as you visit the beautiful Philippine Islands and experience some spectacular locations that are reachable only by staying on the boat and getting out to spots that few get to see. Location is just one of many choices facing you if you’re considering a world vacation. Do I go to Florida? Do I go scuba diving in Hawaii? Where is the best scuba diving? Learn more by reading about scuba diving around the world on our site and others and if you have any questions please do not hesitate to contact us. The Republic of the Philippines is located in Southeast Asia in the western Pacific Ocean. This island nation is comprised of more than 7,000 islands. Separated by seas and other bodies of water, Taiwan lies to the north, Vietnam to the west, Borneo to the southwest, and other Indonesian islands to the south. The Philippine Sea borders this archipelago to the east. Because of its tropical climate, this region is rich with natural resources and biodiversity. The Atlantis Azores travels to Southern Leyte from January to mid-March, during Whale Shark season, when you can experience unparalleled snorkeling action with these gentle giants as well as dive unspoiled slopes and walls throughout the week. From mid-March through early June you can explore miles of pristine drop offs where you will experience all types of marine life at Tubbataha, perhaps the most popular scuba diving season. During the summer months of June through September, the Atlantis Azores is based out of Dumaguete and takes vacationers on its Visayas Safari to visit several beautiful islands in a single week. Based out of Puerto Galera from October through December, each week the Atlantis Azores takes you to explore the region of Anilao, known as the birthplace of diving in the Philippines, and down to the hidden gem of Apo Reef on the west coast of the island of Mindoro. Diving will be done mainly from tenders. Between January and March the liveaboard Atlantis Azores travels to the Philippine Islands region of Southern Leyte. This area, with its many treasures still to be discovered, is gaining in popularity as a premier dive destination. Southern Leyte is perhaps best known as the location where, during World War II, General Douglas MacArthur made his proclamation that he would “return to the Philippines.” Your 7-night charter departs from Padre Burgos in the province of Quezon. You can expect air temperatures to average at least 88°F (31°C). Water temperatures are warm, averaging at least 82°F (28°C). How is that for some of the best scuba diving temperatures around? Visibility is up to 90 feet (30 m.). 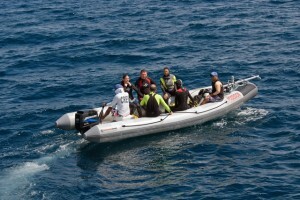 You will experience multiple dive sites along a spectacular 1.6 mile (2.5 km.) coral garden on the west side of Tancaan Point. The more you dive, the more you will enjoy these pristine coral gardens that present walls and gorgeous drop-offs, all replete with marine life. While in the area of Padre Burgos, the dives on your first day may include wall dives at Max’s Climax 1 and 2, Voltaire’s Rock, Bulawarte, and possibly even a night dive at Padre Burgos Pier or the Malitbog wreck site. You should look for big fish action when the current is running. Other marine life you may see at these sites includes Frog Fish, Nudibranchs, Seahorses, Octopuses, Reptilian Eels, Slipper Crabs, Razor Fish, and many others. Your second dive day may take you to Sogod Bay North, where you may dive at Bunga Bend, Cantamac, Whip City, and the Malitbog wreck. The diverse fish and coral life you will find at these sites may include Ribbon Eels, Pygmy Seahorses, Ghost Pipe Fish, Mantis Shrimps, and Nudibranchs. You will probably travel the Liloan Channel to the east side of Sogod Bay next where you will arrive at Panoan Island and the Napantao dive site, which is a protected marine sanctuary. The beautiful wall at this site is covered with giant Gorgonian Fans. The Tankan and Santa Sofia dive sites at the southern point of Sogod Bay present an amazing array of vibrant soft corals and enormous barrel corals. Frequent visitors to these sites include Eagle Rays, Mandarin Fish, Bat Fish, Frog Fish, and turtles. You will experience incredible diving at Limasawa Island, famous as being one of Ferdinand Magellen’s stops on his Pacific voyages. At depths of 65-165 feet (20-50 m.), the dive sites of Adrian’s Cove and Zack’s Cove present dark, steep walls populated with Gorgonian Fans and enormous coral tables. Nudibranchs can be seen here as well as the occasional Hammerhead or White-tipped Reef Shark. While you’re off gassing between dives at Limasawa Island you may wish to venture ashore to visit the shrine where the first Catholic mass was held in the Philippines or see the spot where General Douglas MacArthur made good on his promise to return to the Philippines. Next you will probably travel to San Francisco Bay/Sunok, where you will snorkel in the protected waters of a sanctuary. Between early November and May, Whale Sharks usually make their way to this area as they follow the jellyfish and plankton. You will embark the liveaboard Atlantis Azores for your 7-night excursion to Tubbataha in Puerto Princesa on the island of Palawan. Between March and June the Atlantis Azores travels to Tubbataha, located in the Sulu Sea at the center of the Coral Triangle. Tubbataha is a marine reserve, made up of two reefs, and considered one of the best scuba diving locations in Asia. Home to more than 570 species of fish, 370 species of coral, 11 species of sharks, 12 species of dolphins and whales, and nesting Hawksbill and Green Sea Turtles, photo and video opportunities abound. Wow. Right? You should add camera to your list of scuba diving equipment on this trip! You can expect air temperatures to average at least 82°F (28°C). Water temperatures are similar, averaging at least 82°F (28°C). Visibility is 80 feet or better (25 m.). You will dive at numerous sites at both the North and South Atolls. Your first and last dive days of the trip will take place at the northern tip of North Atoll. Fissures and crevices lead into the dive site. During the day, you may see Nurse and White-tipped Reef Sharks resting. You may also expect to see Stingrays, small Manta Rays, and Spotted Eagle Rays, as well as turtles. Along the wall at this site you may encounter Black- and White-tipped Sharks and Grey Reef Sharks patrolling the area. Look for huge Gorgonian Fans, soft corals, and Barrel Sponges on the wall. The diving is excellent at the southern end of North Atoll. You should see just about every type of native reef fish there is at this site. Everywhere you look you will probably also see invertebrates such as Sea Cucumbers, Nudibranchs, Crinoids, and Flatworms. On your dive at dusk, you will be amazed by the sight of feeding fish, and at low tide, you can see a wreck. Look for large fish, such as Giant Trevally, Dogtooth Tuna, Bluefin Trevally, and Pickhandle Barrcuda. You may also find Manta Rays and Turtles swimming closer to the surface. The northern tip of South Atoll is renowned for the numbers of Green and Hawksbill Turtles to be found here. You will see schools of reef fish and large pelagics such as Bluefin- and Giant Trevally, Narrow-barred Spanish Mackerel, and Great Barracuda. On occasion you may encounter Black-blotched Stingrays, Eagle Rays, and White-tipped Reef Sharks. Friendly Mantas may even show up to perform their graceful acrobatics or play with divers for hours. When you dive at the southern end of South Atoll, you will be amazed by the impressive views over Tubbataha Reef. This area, known as “The Lighthouse”, inspires underwater photographers and divers alike with its vast amounts of small reef fish, sponges, corals, and anemones. Your dive at the southeastern end of North Atoll begins on a gentle slope that is covered in beautiful, untouched corals. This dive ends with a wall completely covered with dramatic gorgonian fans. If you look closely you might be lucky enough to spot a Pygmy Seahorse or two. The current brings in a variety of large fish, including Napolson Wrasses, Red Snappers, Narrow-barred Spanish Mackerel, Giant Groupers, Giant Trevally, and Malabar Groupers. Also spotted in this area are White-tipped and Grey Reef Sharks. Close to the surface you may see Manta Rays, Spotted Eagle Rays, and Hawksbill and Green Turtles. The fish life is amazing; look for African Pompano, Leaf Scorpion Fish, Rainbow Runners, Fire Dart Fish, Angel Fish, and Decorated Dart Fish. The Atlantis Azores’ Bohol itinerary takes you to the island group of Visayas in the Philippines, one of the most beautiful and bio-diverse regions in all of Asia. This 7-night excursion embarks weekly between June and September at the port of Atlantis Dumaguete. At this time of year, air temperatures average at least 82°F (28°C). Water temperatures are similar, averaging at least 81°F (27°C). Visibility is generally 60 feet or better (18 m.). Your first day is spent at Sumilon Island, diving in the crystal clear waters that surround the tranquility of pristine white beaches. You will enjoy the drop offs and exquisite coral gardens in this area. Keep your eyes open for Sting Rays, Manta Rays, Barracudas, Sea Turtles, Snakes, and even Whale Sharks and Hammerheads on occasion. Cabilao is a diver’s paradise. Bordering the island is a drop off where you can enjoy some of the best dive spots the Philippine Islands have to offer. The marine life is rich and varied in this area, with regular sightings of Frog Fish, Barracudas, Turtles, and a variety of Nudibranchs. You may also find Pygmy Seahorses, Thorny Seahorses, and occasionally Napoleons, Jack Fish, and Black- and White-tipped Reef Sharks. About two and a half miles (4 km.) southwest of Duljo Point is the island of Balicasag with its beautiful coralline beach. Dive sites here present steep vertical walls hundreds of feet into the depths, with overhangs that hide Snappers, large Groupers, and Napoleon Wrasses. Here you may also see an abundance of Jacks, Mackerel, and Barracudas. Next you will travel to various dive sites at Panglao Island and Bohol Island, in the middle of the Visayas island group. 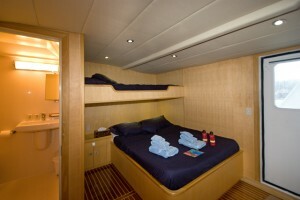 You will not be disappointed with the dramatic walls and spectacular reefs. Numerous species of Nudibranchs, Pygmy and Thorny Seahorses, Frog Fish, and Ghost Pipe Fish can be found along the walls – although they’re not always easy to find! Other marine life you may see includes White- and Black-tipped Reef Sharks, Turtles, Eagle Rays, Manta Rays, and schooling Barracuda and Trevally. Diving at the small island of Pamilican presents a stunning variety of both hard and soft corals. Divers will also see Green and Hawksbill Turtles, Dogtooth Tuna, White-tipped Reef Sharks, Trevally, Napoleon Wrasse, Manta Rays, Wahoo, Eagle Rays, and Banded Sea Kraits. On your final dive day you will dive the waters around Siquijor, referred to by Spanish explorers as Isla del Fuego (Island of Fire). The pristine walls in this area will amaze you. You will find beautiful hard and soft corals, a variety of Nudibranchs, Fusiliers, Parrot Fish, Clown Fish, and schools of Barracudas and Razor Fish. Guests aboard the Atlantis Azores will also have the opportunity to go ashore, to visit Bohol Island where you will see Chocolate Hills, a butterfly farm, and some Tarsiers, one of the world’s smallest primates. You may also enjoy the coral white sand as you explore Alona Beach. From October through December each year, the Atlantis Azores takes guests on an amazing 7-night trip to two of the best scuba diving destinations in the Philippines, Apo Reef and Anilao. Apo Reef is part of the largest contiguous reef system in the Philippines (and part of the second largest in the world). This reef system is part of Apo Reef Natural Park, and is 34 square miles (88 square km.) of remote, protected reef. 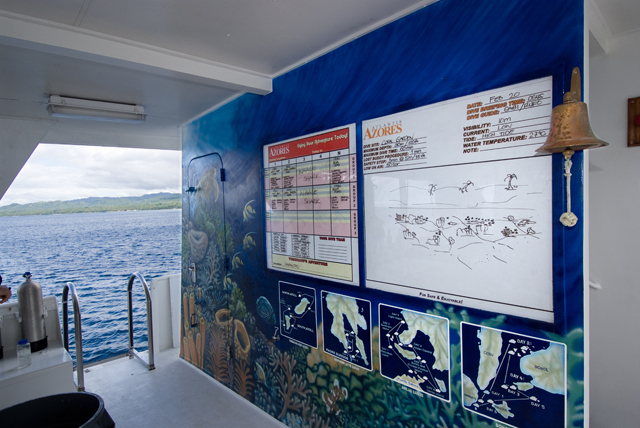 Here, your dives will vary and you will be both amazed and impressed by the variety and numbers of fish and corals you will see. Marine life is drawn to Apo Reef, an open ocean magnet for large pelagics including Sharks, schools of Barracuda, Turtles, and occasionally Manta Rays. Your second destination on this itinerary is Anilao, known as the birthplace of scuba diving in the Philippines, and located in the center of the renowned Coral Triangle. Anilao alone has more than 40 dive sites. At this time of year, air temperatures average at least 77°F (25°C). Water temperatures are similar, averaging at least 77°F (25°C). Visibility ranges between 50-80+ feet (15-24+ m.). Apo Reef along the west coast of the island of Mindoro presents an excellent variety of dive sites. Everywhere you look you will see beautiful hard and soft corals, including large Table, Brain, Fire, and Stag Horn corals. You will find huge drop offs and spectacular walls along the other sides of the island. Strong currents here attract a variety of large pelagics, especially on the northern side of the island. 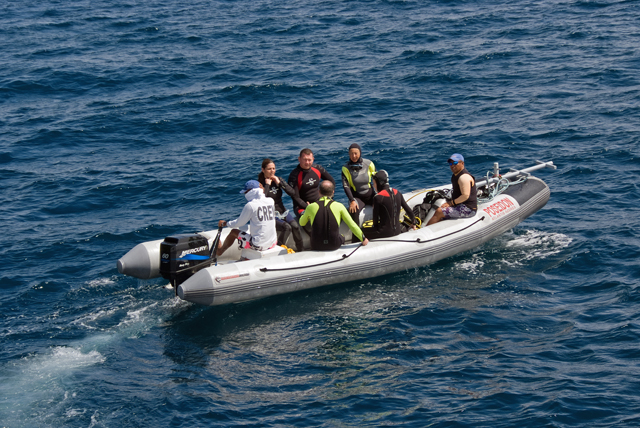 More experienced divers will enjoy the chance to see Dogtooth Tuna, Humphead and Napoleon Wrasses, Giant Trevally, White- and Black-tipped Reef Sharks, Mantas, Grey Reef Sharks, and even Hammerheads. Hunters Rock, best known for the numbers of Sea Snakes that can be found here, is a sea mount located to the west of Apo Reef. Schools of tropical fish such as Butterfly Fish, Snappers, and Sweet Lips reside among the masses of corals and sponges in this area. Also common are Sharks, Trevally, and other predatory fish. The dive site known as Sombrero has walls covered with vibrant, soft corals, colorful crinoids, and sponges including White Finger and Barrel. You may also dive in the area of Anilao Central, including Bonito Island and Balahibong Manok, which is home to an underwater hot spring that was created as a result of the Taal volcano. Parrot Fish, Groupers, Trumpet Fish, Bat Fish, Moray Eels, Comet Fish, Anthias, and Puffer Fish can all be found in this area. The Verde Island Passage is the center of marine biodiversity. 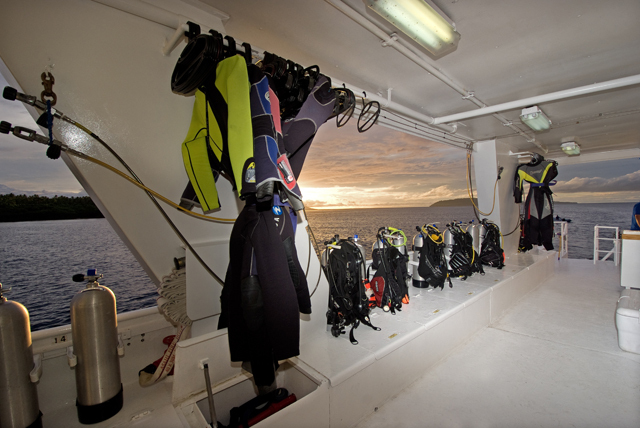 You will have excellent visibility at the underwater pinnacle, as well as exceptional wall diving. Oversized Nudibranchs, and Moray Eels, Lion Fish, Scorpion Fish, and Orange Anthias are commonly seen in this area. This itinerary includes a day trip to see Taal Volcano, called the smallest active volcano in the world. Unique to Taal Volcano is the lake, Crater Lake, located inside its crater. 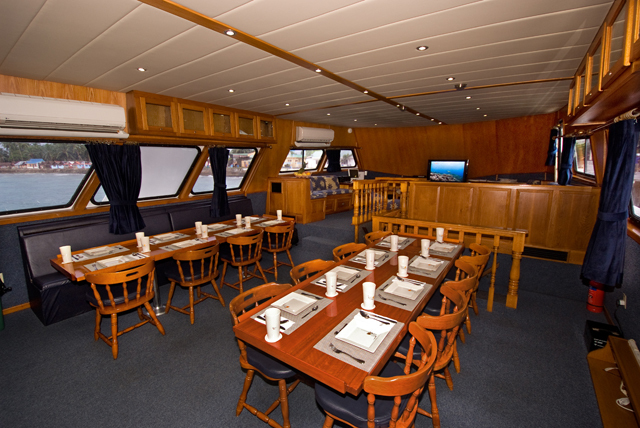 The Atlantis Azores strives to provide scuba divers and guests with the highest quality and most memorable, innovative liveaboard experience possible. In addition to unmatched scuba diving, guests aboard the Atlantis Azores will enjoy excellent accommodations and delicious meals as part of their vacation package. This dive boats affords guests both safety and comfort as it travels to the best diving sites the Philippines have to offer. 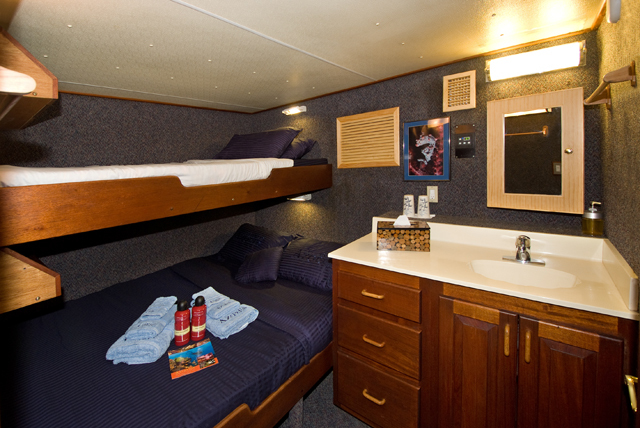 Yes, as far as scuba diving equipment goes – a liveaboard boat ranks high up on the list. And it’s even better when it comes with a hot tub!